At Coral Medical Health Spa in Windsor, Ontario we offer Laser Treatments as well as many other technologies for facial and body rejuvenation. 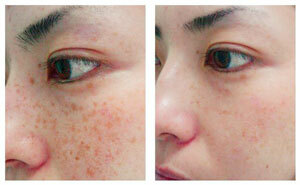 A key area of concern for many people is hyperpigmentation (AKA – sun spots, age spots, liver spots, etc.). To treat this condition Coral offers many different technologies including, Intense Pulse Light, ND: YAG Laser treatments, Microdermabrasion, Chemical Peels, Cryoprobe and homecare products. 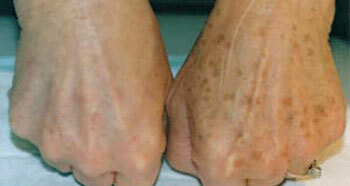 Darkened areas (hyperigmenation) on the epidermis from over exposure to the sun are called age spots or pigmented lesions. These spots are caused by an overproduction of melanin; the substance that gives hair, skin and the iris of the eye it color. More often than not, sun and age spots are benign and resemble freckles. Age spots are considered one of the five primary indicators of aging caused by the sun. Laser treatments can remove the imperfections caused by a wide variety of benign pigmented lesions. The Cynosure Apogee Elite laser effectively treats pigmented lesions-including discolored spots, freckles and sun-damaged skin areas. Utilizing the ND:YAG laser technology, the certified laser technician will utilize the laser light to “bring the color” to the surface and then the body sheds the pigment naturally. In addition to the laser treatment it’s important to remaining out of the direct sun exposure and use a physical sun block of SPF 50 or higher to help decrease the number of spots and prevent new ones from occurring. Specifically we recommend Solar Protection Mineral Sun Block SPF 65. To learn more about this treatment please schedule your complimentary consultation today by contacting guest services. A: The number of treatments is dependent on such factors as lesion depth and size. However, most people need three to five treatments and begin seeing results after only one or two sessions. Q: Is there any recovery time needed? A: No rest or recuperation time is needed. Use of sunblock is mandatory. You will be able to resume normal activities without restriction. Q: How often are treatments required? A: Treatment sessions are scheduled every 3-4 weeks. All use the laser light to “bring the color” to the surface and then the body sheds the pigment naturally. Several treatments may be necessary for complete clearing of the sun damaged area. Age spots that seem suspicious will be reviewed by Dr. Sherman before beginning treatments to verify the age spots are benign.